Marie hadn’t intended to cause a war between the planets. She’d just gotten something in her eye while cycling. The more she rubbed at it, the further it worked its way into her eye socket. She rushed home, stuck her face under the faucet and pried open her eyelid. The water stung the microscopic scratches on her cornea, but eventually the particle dislodged. Thanks to her blurred vision, Marie completely overlooked the sand-sized spacecraft swirling down the sink, and with it, the ambassadors of peace. A few days later, the aliens declared war. Remember, kids: when cycling, wear eye protection. Orbit has a double meaning. We usually use it in its astronomical sense, to mean the course of one object traveling around another. The moon orbits the Earth. 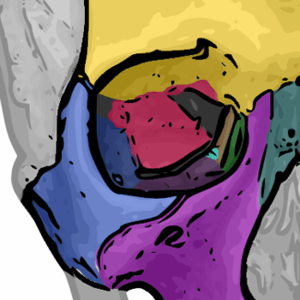 In anatomy, orbit refers to the eye socket in the skull. The skull’s a very strange and unique component of the human body. For one, it’s not just one bone. It’s difficult to say just how many bones are in the skull because it depends on what you mean by “bone” and how you count them. Why the trouble with counting? You see, your skull doesn’t finish developing until after birth. Infants have four “soft spots” on their noggins called fontanels which are places where the skull bones haven’t fused together yet. The fontanels serve two purposes: to allow for easier delivery, and to allow space for the brain to finish development after birth. When these fontanels finally fuse, they’re joined together with sutural bones that can vary in number from person to person. My anatomy textbook goes with a fairly traditional count of 22 bones forming the skull. Of these, 7 bones help make up the orbit. I had fun writing today’s story because it captures orbit in both its meanings. A microscopic fleet of alien ships is in orbit over the Earth, attempting to make peaceful contact. One of their ships is in the orbit of Marie’s eyeball. All this orbiting adds up to be one huge headache for everyone. For those of you in the United States, happy July 4th! I hope you enjoy the holiday with good food and good company, and hopefully better weather than we’re having in Georgia today. For those of you outside the US, hang in there. Friday’s coming soon. And whatever you do, remember: wear eye protection. Peaceful intergalactic relations might depend on it. Aha! Very clever. Yes, without eye protection, one might start an interstellar war. Everybody knows THAT! Hehe. Loved this.